Goldfields must have been exciting places for children, but also unsettling and dangerous. Families moved about a lot. They often lived in makeshift shelters and there were hazards everywhere. Open fires, unprotected mineshafts and fast-flowing water courses all took their toll. But the greatest threat to children, especially young children, was disease. Whooping cough, measles, diphtheria, and scarlet fever spread quickly in the crowded, unsanitary conditions. In the 1850s one quarter of all the recorded deaths in Ballarat involved children under five. 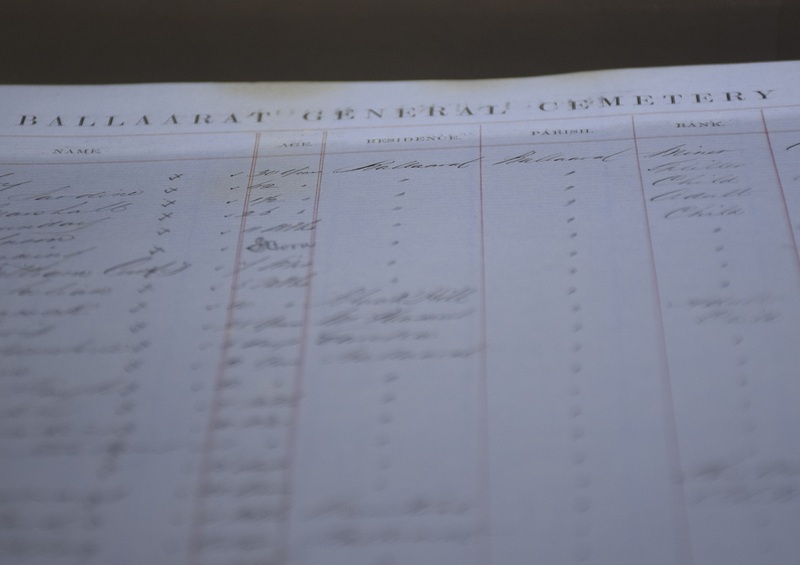 The record book from the Ballarat Cemetery is a sobering reminder of infant mortality. Of the 40 entries on one page, for example (February 1857), 26 were children, including 17 children under 12 months who died of dysentery. Object property of Ballarat General Cemeteries Trust. 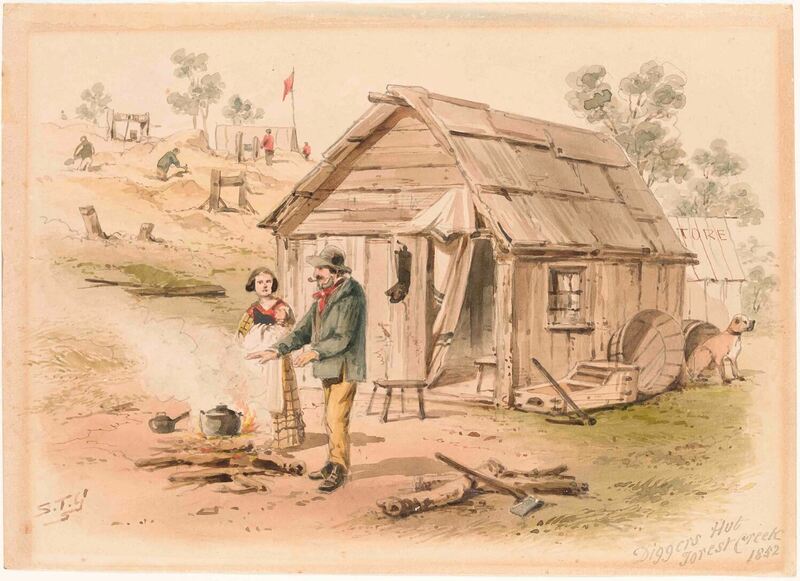 Most families on the early goldfields could not afford a doctor. In 1854 four-month-old Jean Edoes Carey died of a fever. When the coroner asked Patrick Carey why he had not sent for a doctor, he replied: ‘Because we had not a blessed sixpence in the tent’. Click here to read the Coronial inquest into the death of Jean Edoes Carey (6mb). Reproduced courtesy Public Record Office Victoria. In any case doctors at this time could do little to fight a child’s raging fever, or treat diarrhoea. A popular remedy for dysentery was chalk, opium and brandy – but these were expensive ingredients and hardly suitable for a child. Here artist Samuel Thomas Gill depicts a family at work. While the man pours water into the cradle, the woman rocks it back and forth, while nursing a baby. Behind her a boy is also at work, shovelling dirt. 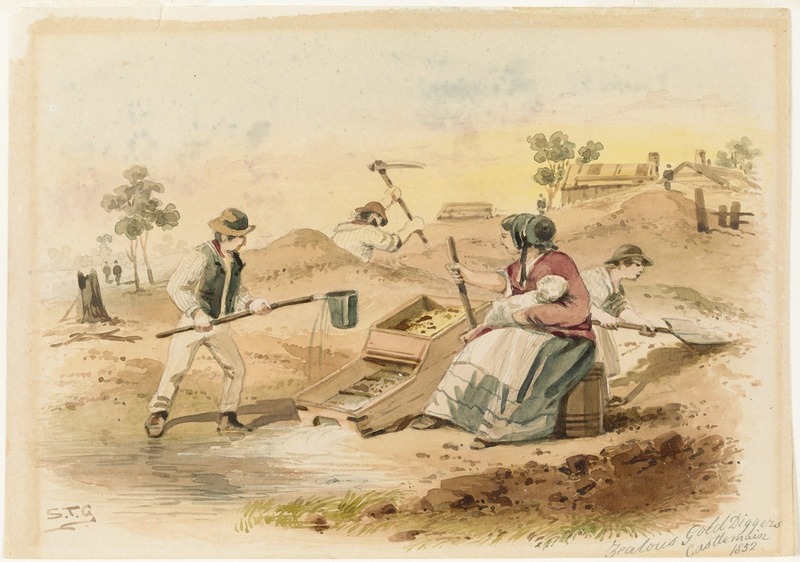 We know that children worked on the goldfields, sometimes alongside their parents, sometimes in teams with other men. The work was hard for children and could be very dangerous. Reproduced courtesy State Library Victoria. This digger’s hut is rough, but probably much better than most shelters on the diggings. Conditions were very hard for women, cooking over open fires and with no other facilities. Managing babies on the diggings must have been especially difficult – and dangerous! Watercolour by Samuel Thomas Gill, 1872. Reproduced courtesy State Library Victoria.